It was 12 years ago this spring that I stood in front of an auditorium filled with people from the community who had all come together to try and save my high school. I remember pleading to the school board to keep my high school’s doors open, ending my speech in tears as I handed the panel of directors my high school yearbook. I can picture that day in my mind like it was yesterday and feel as strong about Port Dover Composite as I did that day. Despite the community’s best efforts over the last 12 years, the small town I have grown up and loved so much has closed the doors of its high school forever. When the announcement was made, I watched throughout the day on Facebook and Twitter as friends were voicing their opinions towards the decision makers, sharing their memories of good times with their friends and expressing their mourning for a loss of a piece of their history. Sadness began to surface for me as I read through not only my closest friend’s comments, but also all the other people on my Facebook who are connected to me, not only because they too are PDCS grads, but because they have a common outlook on what it means to live in a small town. As I looked through photographs posted of the empty hallways, it was as if someone had just taken the five years I had spent at PDCS growing up; learning life’s important lessons and having fun with friends. You would think, come on, it’s just a building, how could anyone form an attachment to concrete walls? But inside those walls we grew together as a young community and formed a loyalty and understanding of what it is to live in a small town. You might not realize it is there, or how strong it is until it’s being attacked. It’s as if, by closing those doors, all of our memories are being washed away into the shadows. The hurt began to intensify as I realized that the connections we formed are not going to be built for the generations below us. I was surprised when my emotions began to surface as the realization set in for what this means for Port Dover now that my high school is gone forever. Closing that school doesn’t only affect the students who will not graduate this year, or the next, it affects everyone in Port Dover. We have all been exposed to countless articles, radio interviews, blogs, Facebook pages, and conversations about how important a high school is to a small town. How will closing the school will affect local businesses that depend on students for after school shifts? How would keeping it alive teach a sense of community to our younger generations? I love that I can go to the Norfolk Tavern on a Saturday night and see familiar faces that I can strike up a conversation with, not because they are my closest friends and I had planned to meet them for a night out, but because we are from Port Dover and feel connected. We can thank PDCS for those connections that have been made. A small population allows you to accept and respect people’s differences and become friends with someone you may not have necessarily thought you would have been drawn to. In that, I think PDCS taught me one of the greatest of life’s lessons, and that is the closest thing to peace that you could imagine. I envy the people, and the communities, that are lucky enough to have a high school in their area now. It is more important than they probably realize, and it is my hope that they won’t ever have to endure anything like what Port Dover has in its 12-year struggle to stay alive. From this struggle though, there is something we can all learn, whether we were involved or not. Social media platforms can play an integral part for any community or group who is fighting towards reaching a common goal or saving something they believe in. From my parents’ generation of graduates who saw the doors of PDCS first open, all the way through to the students who will not have the pleasure of graduating from PDCS this year, Facebook allowed them to easily plan online how they could protect and fight to keep their community alive. When the struggle was finally over and the battle was lost, Facebook became a place for those to grieve, mourn, share memories and provide support to one another. 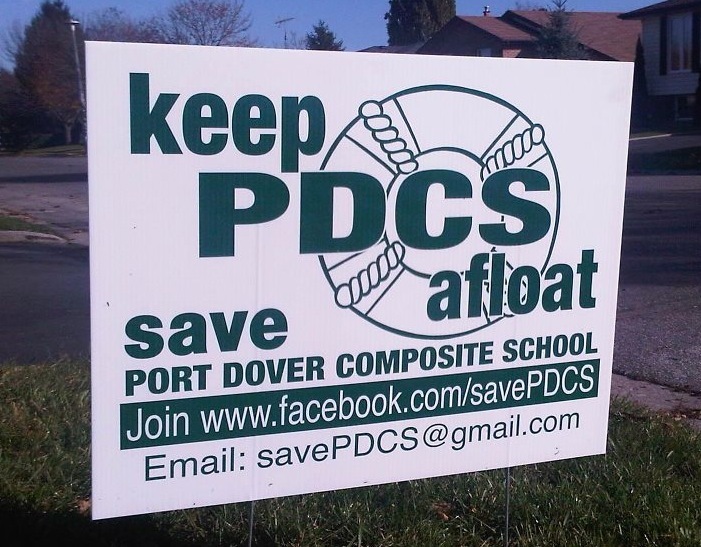 It is kind of ironic that, in the effort to keep PDCS open, it proved that Port Dover’s sense of community exists so strongly because of its high school. I encourage everyone to take a minute to reflect on your own high school years, the events and people that shaped and made them what they were, and how your community may have come together at times to celebrate achievements made by its area’s youth. Then ask yourself, how different those memories might be, or how disconnected your community might have been if that high school didn’t exist?